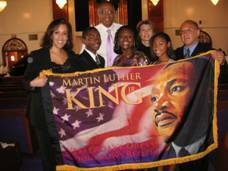 Dr. King's flag now available at the Martin Luther King, Jr. National Monument and Memorial Gift Shop! Ross Flags and Designs unveils the new Cesar Chavez flag. 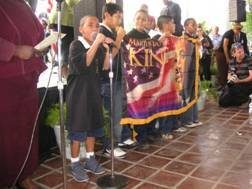 This is the first licensed flag (licensed by the Cesar E. Chavez Foundation) with the image of Cesar Chavez. 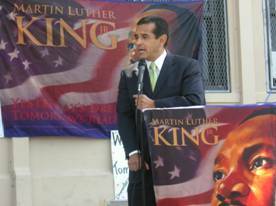 The flag will be displayed daily at The National Farmworkers Service Center honoring the life and legacy of Cesar Chavez. 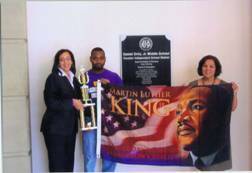 Maria Ross and sponsor Dee Dee Bates of State Farm presents Dr. King's flag to Dallas area schools......Thank you Ms. Bates! 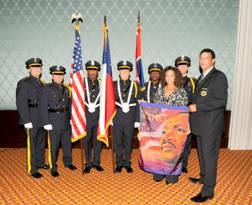 Maria Ross speaks at RAINBOW/PUSH Martin Luther King, Jr. Breakfast unveiling Dr. King's flag. 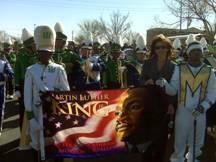 The Kansas African American Museum donates 100 MLK flags to local schools! 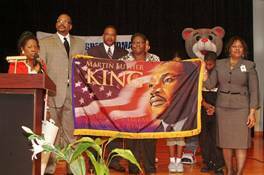 Dr. King's flag is in King Day parades throughout our great country! 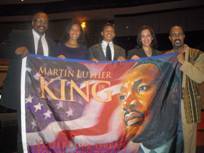 As the nation prepares to celebrate Martin Luther King’s birthday this month, the King family is urging people to remember the true meaning of the day. The holiday theme, “Remember! Celebrate! Act! 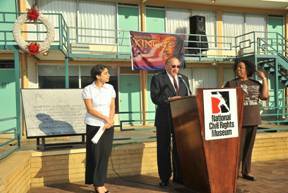 A Day On, Not a Day Off,” sponsored by the King Center in Atlanta, reiterates the importance of recalling Dr. King’s work for human rights and acting on his teachings of nonviolence and commitment to serving others. In the year 2000, Maria and Dwayne Ross were living the American Dream. Both graduated from college with "well-to-do" degrees. They had two beautiful children. The only thing left to do was purchase a home. And so they did. 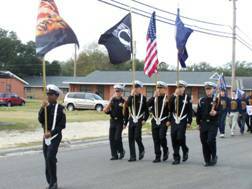 The couple moved to an upscale neighborhood in Katy, Texas. 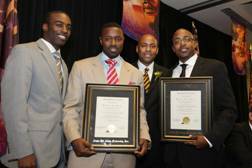 The National Conference of Black Mayors invites Dwayne Ross to speak at their 2009 Fannie Lou Hamer Luncheon. 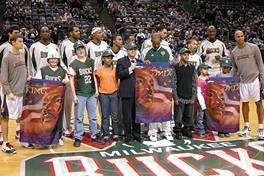 Dwayne shared the story of the creation of Dr. King's flag and how his family dealt with the aftermath of being victims of a hate crime. 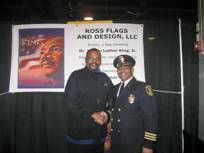 Ross Flags and Designs gifted the honorees which included Reverend Kyles, Reverend Sharpton, Dr. Dorothy Height, Benjamin Jealous, Reverend Jackson and the President of the NCBM, Ms. Vanessa Williams. 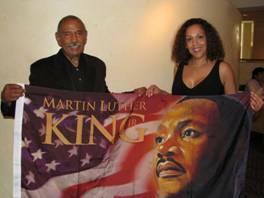 Dwayne and Maria Ross have successfully accomplished a task few businesses have been able to do: The couple has inked a deal with Intellectual Properties Management Inc., the exclusive licensor of the Martin Luther King Jr. estate, to manufacture and distribute a flag that carries the slain civil rights leader’s image. 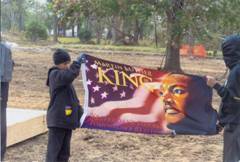 Maria meets Congressman John Conyers, Jr.
KIPP Future School site ground breaking ceremonies on Martin Luther King Drive, MLK Flag is displayed on grown breaking ceremony by students. 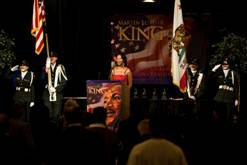 Inland Empire, Ca City News April Issue, articled entitled, “Two couples work to keep MLK’s dream alive”. Maria Ross of Texas and in-laws Kevin and Lori Ross of Chino Hills, Ca. 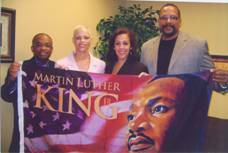 Now market Dr. Martin Luther King Jr. flags and banners, the only authorized agents to do so in the United States, as an educational and cultural training tool for children and adults. 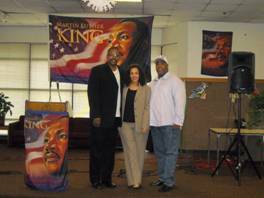 Dallas SCLC President, Pastor Derrick Bowman invites Maria and Dwayne to MLK Assassination Commemoration held at MLK Community Center. 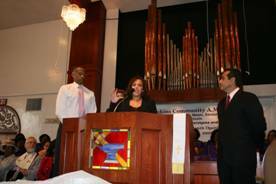 Mayor Villaraigosa, Bishop T. Larry Kirkland, and Reverend Joseph Nixon host African American Heritage Month at Brookins AME in Los Angeles. Maria Ross speaks to the congregation at their prayer breakfast. 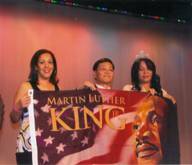 Chino Hills Champion, January 2009 issue, article entitled, “Chino Hills couple promoting flag honoring Dr. King. 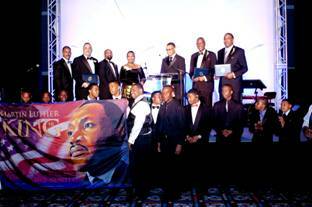 SCLC Greater Los Angeles & SCLC Dream Foundation, 32nd Annual Leadership Conference embraces Dr King’s Flag. 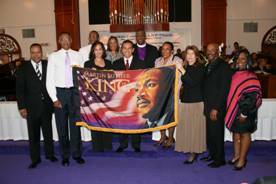 Dallas, Texas - Press Release Commemorative MLK Flag presentation to Dr. Frederick D. Haynes III, Senior Pastor of Friendship-West Baptist Church. 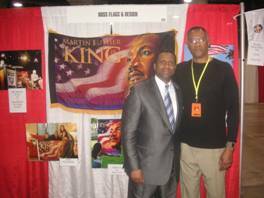 Kick-off of Frederick Douglass Academy MLK Flag Fundraiser. Los Angeles Inter0Alumni Council, President Luther Williams invites Maria Ross to speak at January 2009 meeting. 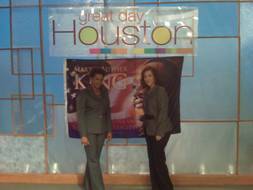 Houston Style Magazine writes story about Dr. King’s flag.